After a very extensive preamble, here is my revised version of Nigella’s Nutella Cake. The ingredients are the same but I’ve added more detail to the directions after I encountered difficulties. Yum! Just check out all that Nutella and melted chocolate. To be perfectly honest with you, this cake is NOT easy to make. You have to separate eggs and whisking the egg whites by hand, is open to disaster and exhaustion and after two attempts, we’re still fine tuning the cooking time. It also generates a lot of washing up. However, there’s something about this cake that encourages me to persevere. It definitely improves after a night to set in the fridge and I love it served with fresh raspberries and cream and I needed a good coverage of roasted hazelnuts on top to break up the richness of the cake. They also provided that much sought after “crunch”. So, I would consider this a special occasion cake for adults.While my kids do have a very sensitive palate and don’t like dark chocolate, they found the cake “too bitter” and really didn’t like it. As I found Nigella’s icing too runny after two attempts, I have included an alternative recipe for dark chocolate ganache, which has worked for me in the past. Sifted icing sugar to taste. Melt chocolate in the microwave, following packet instructions. Put aside to cool slightly. In a large bowl 1: whisk the egg whites and salt by hand until stiff but not dry. This means soft peaks but not until the foam starts to ball up. Put aside but you need to move quickly or the foam will liquefy. In Mix Master bowl 2: Beat the butter and Nutella together, and then add the Frangelico (or whatever you’re using), egg yolks and ground hazelnuts. Into Bowl 2: Fold in cooled, melted chocolate, then lighten the mixture with a large dollop of egg white, which you can beat in as roughly as you want. Bowl 2: Fold in remaining egg white a third at a time. Pour into a 23cm/9 inch round greased and lined springform tin and cook for 40 minutes or until the cake’s beginning to come away at the sides, then let cool on a rack. The cake will still be moist and wet inside, so do not overcook. Hazlenuts: Toast the hazelnuts either in a moderate oven or in a dry frying pan until the aroma wafts upwards and the nuts are golden-brown in parts: keep shaking the pan so that they don’t burn on one side and stay too pallid on others. Transfer to a plate and let cool. It’s imperative that they’re cold they go on the ganache while If your hazelnuts have skins on then after toasting in the frying pan transfer them to a slightly dampened tea towel and rub them while they are still warm to remove the skins. Unmould the cooled cake carefully, leaving it on the base as it will be too difficult to get such a damp cake off in one piece. Ice the top of the cake with ganache, and cover with whole, toasted hazelnuts. Slice cake into small portions, as it is quite rich and plate up with a generous scoop of raspberry cream. Enjoy and if you do make the cake, please let me know how it goes. I’m rather curious. This entry was posted in Recipes and tagged baking, cake, chocolate, chocolate cake, company, dessert, hazelnuts, Nigella, Nigella Lawson, Nutella, raspberries on June 16, 2016 by Rowena. Once upon a time, Nigella Lawson published her hit cookbook: How To Be A Domestic Goddess. The book included her famous Nutella Cake, which I have subsequently tested, crashed and tasted. Basking in the media spotlight, however, Nigella was oblivious to the troubles brewing on distant shores. That while there was the beauty, there would also be the beast. That her once elegant creation, would erupt with a dangerous avalanche of chocolate ganache and roasted hazelnuts all over a fancy plate. Moreover, that this mighty beast, which should only ever been known as “The Avalanche”, would masquerade around the World Wide Web as Nigella’s Nutella Cake…the very one, yet nothing like the same. I’m sure she’s not amused! If anyone was within their rights to sue, Nigella has a very, very strong case. Looks like I’d better watch out! Please forgive me, Nigella. I have sinned! Of course, once you publish anything, you have to let your “baby” go. Leave it, for better or worse, in your reader’s hands. That’s the risk you take. Otherwise, all of us writers would simply leave all of our babies locked away in the bottom drawer. However, when you’re a famous chef or cook and your baby is a recipe book, the risks intensify. Not only will your readers inevitably criticise your work, they could well screw up your recipes and post photographic evidence on every social media platform on the planet. This, of course, is an absolute public relations disaster! Your reputation, your precious reputation is hanging round your ankles along with those wretched undies with the broken elastic, and it’s not your fault! No doubt, that’s too much for even a Domestic Goddess to bear! Dip your finger in! Can’t you just taste the Nutella’s magic? After all, is it her fault that they can’t follow a simple recipe? That they don’t understand that “whisk the meringue” doesn’t mean beat the living daylights out of it, sending it past the Emergency Department and straight to City Morgue. It’s not HER fault that the meringue’s gone flat because you forgot to prepare your ingredients beforehand (a process known as mise en place among chefs) and had to send your nearest and dearest off to the shops to replace the chocolate someone else has thieved from the pantry. AND, it isn’t Nigella’s fault they have a temperamental oven, whose temperatures yoyo up and down like it has a weird tropical fever. However, when her challenged followers show off their flops, Nigella gets the blame. That is, as long as they don’ claim “it was an act of God”. Anyway, after seeing Nigella on Australian Masterchef recently, I was inspired to bake her Nutella Cake. Although I’ve had a few baking disasters in the past, I was quietly confident. The recipe says it’s easy peasy and how could a cake made with a jar of Nutella, possibly go wrong? My son adding extra Nutella to his cake. He doesn’t like dark chocolate and found the cake “bitter”. Or, on the other hand, maybe not! Indeed, even for me, this cake was a disaster and I’m actually struggling to find anything I did right. It all began with beating the egg whites. Or, should I say “whisking” the egg whites. I forgot that I wasn’t making my pavlova. That “whisk” really means is “hand whisk” using one of those big balloon-shaped contraptions you see on Masterchef. Then, there were the cooking times. We had a lot of trouble trying to work out when the cake was ready. Unfortunately, this was compounded the fact I had to go out while the cake was still in the oven and left its future in my husband’s usually very capable hands. He did what you usually do. Stuck a skewer in the cake until it came out clean. That was until the top started “caramelizing” and he realized he’d missed the moment. However, overcooking it meant I could cut the cake in half to fill it with whipped cream and fresh raspberries. Well, that was until the top layer broke into several pieces which I patched up again with my sloppy ooze of milk chocolate ganache. Yes, despite beating and adding icing sugar and butter, the icing never resembled a spreadable consistency. Time to take a swig of the Frangelico. By the way, Nigella recommends serving a glass of Frangelico with the cake. I should mention that I used milk chocolate for the ganache as my kids don’t like dark chocolate. They have sensitive taste buds and I suspect they could be supertasters. Supertasters have extra tastebuds on the tongue. That must be it. Surely, it’s not my cooking?!! As if The Avalanche hadn’t already been through enough, it’s troubles weren’t over yet. The following day, Geoff found our dog, Lady, her royal scruffiness, with paws up on the table, tail wagging and half the cake missing. Not good for the cake…or the dog! Chocolate can kill a dog. Thank goodness I didn’t go with the dark chocolate for the ganache! Why can’t that dog tell that eating chocolate is a health hazard? Can’t she read the packaging? What’s wrong with the mutt?!! So, after all of these compounding mistakes, I was starting to think this cake was just doomed and that Nigella and I were like oil and water. We simply didn’t mix. I was never ever going to be a domestic goddess! However, my husband had other ideas and said it was worth: “another go”. This leads me to Round Two, which was certainly a vast improvement but still wasn’t trouble-free thanks to the oven and the fridge. Have you made any of NIgella’s recipes? I must confess that I’ve never even seen a copy of How To Be A Domestic Goddess and found the recipe online. This entry was posted in Baking, Recipes and tagged authors, books, chocolate, chocolate cake, domestic goddess, hazelnuts, home, Nigella, Nigella Lawson, Nutella, publishing, raspberries, writing on June 14, 2016 by Rowena. Nigella Lawson is a legend in the kitchen…the original “Domestic Goddess”. Sadly, we mere mortals can only dream of finding a magic wand to convert our TV dinners, burnt offerings and tinned spaghetti on toast, into something out of the pages of her cookbooks. Actually, I’m not a bad cook. Indeed, I am renowned for my pavlova, pancakes, Chocolate Chip Cookies and roast dinners. I’ve even successfully tackled Jamie Oliver’s Lasagna. Moreover, I’ve also been teaching my kids to cook and I must admit, they’ve also been teaching me. I’m not that arrogant to believe that this teaching the kids stuff is a one-way street. I learn a lot too. Nigella’a Nutella Cake with Rowena’s Raspberry Cream. However, my trouble is with consistency, which more and more, I’m also attributing to NOT being in the Masterchef kitchen. I know you’re probably thinking that only a bad cook blames their appliances but you just tell me the last time you saw frozen eggs appear in the Masterchef kitchen? That’s right…NEVER!!! Indeed, I had NEVER EVER seen frozen eggs before either. By the way, when I say frozen eggs, I’m not talking about the ingredients of an IVF stew. Rather, I’m taking about raw hen’s eggs. I store our eggs in the fridge and somehow the temperature control had been moved and we had frozen eggs. Not all of them, just a few. When I cracked them open, they’d turned into sloppy ice cubes and couldn’t be used..especially for Nigella’s cake, which was built on fluffy egg white. After all, I could hardly separate the yolk from the white when they were fused together in an amorphous blog of ice. Moreover, freezing destroyed the cell membranes. So, even once the eggs finally defrosted, they were completely useless and looked in need of Viagra. I’ll say no more. So, when I blame my cooking disasters on my appliances, I’m not just making excuses. It’s true! “The Avalanche”…My first Attempt at Nigella”s Nutella Cake with Milk Chocolate Ganache. Indeed, I think there’s some kind of appliance mutiny or rebellion going on in my kitchen and it’s spreading beyond the fridge. In what might seem an unlikely union of forces, the fridge is in cahoots with the oven. You see, our oven has a faulty fan. That same fan makes your oven “fan-forced”, which makes quite a difference to the temperature of your oven and cooking times. Moreover, when the fan isn’t working, it also means that your food doesn’t cook evenly and horror of horrors, you might need to open the oven door and turn things around. If you know anything at all about baking cakes, especially sponges, you’ll know that opening the oven door is the kiss of death, which deflates your lofty sponge faster than a speeding bullet. Just to complicate things further, our oven fan sometimes works and sometimes doesn’t and turns itself on and off during a bake. Clearly, that oven is not my friend. So, with a faulty oven and frozen eggs, for a second time I set out to replicate Nigella’s Nutella Cake. I don’t know whether you’d say I was brave or crazy because even before I’d melted the chocolate or whipped up the egg whites, there was trouble. While all those motivation types would tell me: “Never give up” BUT haven’t they heard of what’s meant to be? Or, more pertinently, that something “wasn’t meant to be”. Quite frankly, I don’t think it’s being a a quitter or a loser when you decide to stop banging your head against a brick wall and try something else. Use a lateral approach. Everybody’s different. We’re not all meant to fit into the one, same pair of shoes. Our son smothered his slice with Nutella. Found the cake too bitter. That was without the icing. Neither of our kids like dark chocolate. The other problem I had with Nigella’s Nutella Cake is that my kids didn’t like it. My son slathered his slice in Nutella to mask the “bitter” taste and my daughter didn’t eat it. Even though the cake does have Nutella in it, which my kids absolutely adore, it also has dark chocolate which they can’t stand. Based on their comments, I’d say it’s more of an adult cake and even then, you only need small portions. It’s quite rich. I also felt it I needed raspberries and cream in addition to the generous covering of whole roasted hazlenuts found in Nigella’s original. She also recommends eating it with a glass of Frangelico and perhaps I should have tried that, but it was a busy night. I hope half of this is still in the fridge. I’m feeling sick just looking at all that Nutella….even though I really love it! So, at this stage, I don’t know whether I will make Nigella’s Nutella Cake again…even with my modifications. Most of my cooking is for our family and I can’t see the point of going to so much trouble to make a cake my kids don’t like when there are other cakes and desserts we all enjoy such as Apple Crumble with fresh custard. Although the recipe says it’s easy, you’re separating eggs, whisking egg whites by hand, melting chocolate, using two separate bowls…that’s a lot of fiddling around and cleaning up for one cake, which I still haven’t been able to perfect on my second attempt. This time, the cake was good but the icing was still runny. Still, my husband and I enjoyed it. On a more positive note, I’ve just returned for a second piece 24 hours later and really loved the cake…with or without the cream and will be making it again. The cake much much more moist. The icing had set and it was a great flourless hazlenut chocolate cake. Something I really would be proud to serve for guests. With Masterchef gracing the airwaves, that’s quite an endorsement. Perhaps, I am a Domestic Goddess after all and my spirit is soaring… on chocolate wings! My baking no longer human. It’s divine. PS I will be posting the recipe in my next post. This entry was posted in cooking, Humour, Kids learn to Cook, Photography, Recipes and tagged afternoon tea, baking, cake, chocolate, chocolate cake, dessert, food, hazlenuts, Nigella, Nigella Lawson on June 13, 2016 by Rowena. 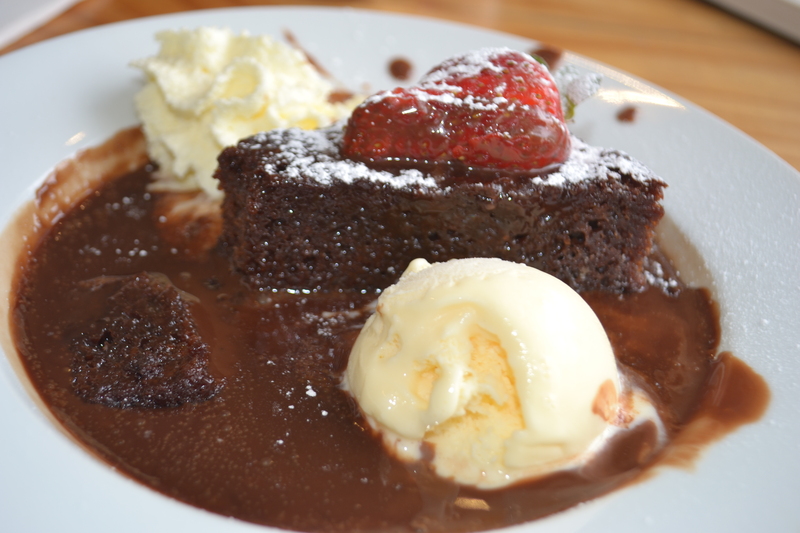 Therapeutic Indulgence: A Rendez-vous with Laksa and a Saucy Chocolate Cake. In my last post, I confessed to running away from home for the weekend for some seriously self-indulgent R & R after a rough week of medical tests for our daughter . While Saturday saw me catching the ferry to Palm Beach and time traveling back into my early 20s, on Sunday I caught a lift to nearby Avalon for a seriously indulgent feast. That’s right…food glorious food! So you can go stick your green smoothies and assorted super foods where the sun don’t shine. I’ve now subscribed to the pleasure principle and I’m in hot pursuit of some seriously indulgent foodie treats!! Yoda has been relocated to Sydney’s Avalon Beach. My first stop was lunch at Yoda. 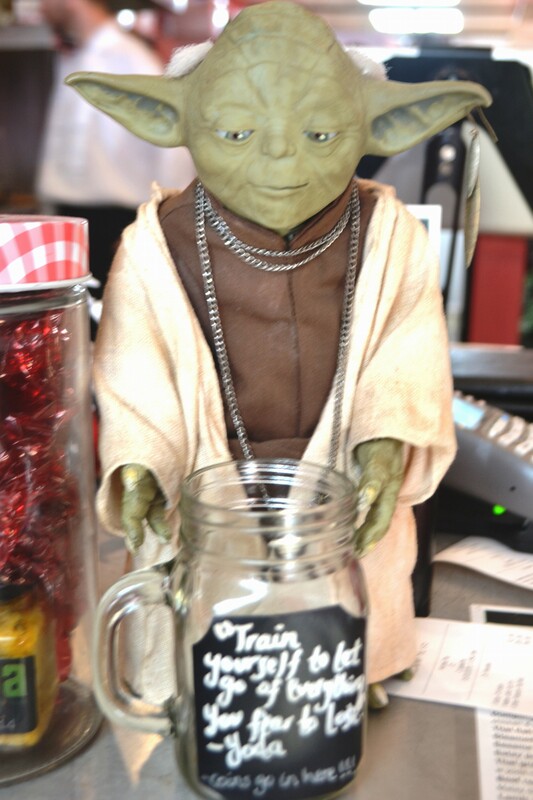 Yoda is the sort of place you’d expect to find tucked away in an alleyway in South-East Asia. Yet, it has somehow astro-traveled to beach-side Sydney via the Millennium Falcon so now I can safely enjoy those authentic Asian flavours without catching some ghastly, turbo-charged, gastro bug. I’m not always an adventurous restaurant eater and often stick with what I’ve had before and really enjoyed. I don’t get to eat out all that often and so I don’t like taking chances. The food not only has to be good, it has to be something I love. L-O-V-E LOVE!! It also has to be better or different to what I cook at home and I’m a good cook. When we go to Yoda for dinner, I tend to order the Tea smoked duck with freshly spiced orange sauce & coriander salad or the Vietnamese chicken cabbage salad with peanuts, roast garlic & house dressing. These are both fabulous, authentic dishes. However, I thought I’d try something different and chose Laksa lemak which is a coconut soup with chicken, prawn, fishcake, noodles & cucumber/coriander salad. This was such a treat and I felt like I was casting a fishing line into the richly fragrant soup. Hey presto! I caught some octopus, fish cake and then a few prawns. It was such a treat and much more productive than any of our fishing expeditions where we’ve only caught fingerlings we had to throw back.The seafood was really well cooked and tender and the Laksa soup with it’s rich, aromatic flavours, was just divine. However, the food wasn’t all I experienced at Yoda. As I shared in my previous post covering the ferry and bus ride over, when you travel alone you met such a smorgasbord of interesting characters. Sitting at Yoda, the gentleman next to me struck up a conversation. I’m not saying he was trying to pick me up or anything like that. It’s just what Avalon is like…so community oriented and friendly that you don’t think twice about talking with total strangers. Anyway, my new-found friend is “batching” while his wife’s away for an extended time looking after her sick mum. This has left him in a bit of a spot. Should he spend month after month staying home in front of the box by himself or get out there and keep living? It’s a hard call. He kept saying: “you only come this way once”, which is so true. Nobody wants to waste whatever precious time they have left. From what I understand this means going out to see a few bands. Eating out. We all want to carpe diem seize the day but when you’re married and your partner is out of action for whatever reason, what are you supposed to do? Stop breathing? I don’t know. As an extrovert myself, I could sympathise. We all have to get out, although that said, there are certain activities which should be curtailed.He told me his wife had called saying she’d heard he was at Palm Beach with a blond and he replied: “At my age, what did you expect me to have? A bucket & spade?” No to be fair, mentioning a blond conjures up all sorts of connotations where as if she’d been hanging out with a woman with glasses, for example, would it be so evocative? Anyway, he had a fine wit and certainly had me in stitches and I suspect he’s been up to no more mischief than wishing he was 21 again! After indulging at Yoda, I headed across the road to Bookacino, a landmark Indy bookshop with a cafe out the back. For a die-hard bibliophile, Bookacino reminds me of exploring your grandparents’ home with all its nooks and crannies. Exploring row after row of titles, you never know what you might find and the new worlds those pages will open. Being an insatiable sticky beak, I just love it. Of course, despite our cascading columns of books and claustrophobically packed bookshelves, I can’t go into Bookacino without taking new “friends” home. After all, how could I ever leave a great book homeless and alone? Oh no! It needs love, family, a place to call home! This might sound like very faulty logic. After all, how could a book living in a crowded bookshop with thousands of friends, or possibly rivals, ever be considered homeless or even alone? However, the heart tells a very different story. I hear its cries!! This time, I walked out with The Art of Belonging by Australian social commentator, Hugh Mackay and a colouring-in book: The Impressionists. for our daughter. Next stop was Cafe Ibiza. To be perfectly honest, I must confess that I wasn’t going there for health food. Rather, I was looking for the most indulgent, decadent chocolatey chocolate thingy that I could find. Something so evil it would smash the evil calorie counter. What I found, even exceeded all of my superlatively luscious, chocolate fantasies. 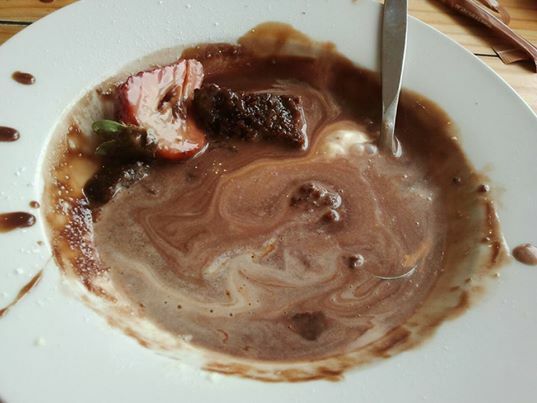 A simple chocolate cake warmed and smothered in chocolate sauce and as I ate the cake, the chocolate sauce became a sumptuous soup. I dove deep into its incredible depths and didn’t even rise to draw breath. Oooh! Death by chocolate never tasted so good! After such indulgence, I’m of a view that “when you’re on a good thing, stick to it” and I’d much rather stick to an endless supply of chocolate sauce than a can of Mortein insect spray. So now I’m on the search for the ultimate chocolate sauce recipe to hold me over until my return. It’s a matter of life and death!! After such therapeutic indulgence over the weekend, I’ve decided that I need to throw caution to the wind closer to home and break out more often. After all, we only live once! This entry was posted in Australia, Baking, Health, Humour, Love and tagged aging, Asian, Asian food, Australia, Australian, Avalon Beach, bibliophile, book, books, carpe diem, chocolate, chocolate cake, commitment, cooking, diet, eating out, extrovert, fishing, green smoothies, Hugh Mackay, introvert, Laksa, marriage, Palm Beach, Pittwater, relationships, restaurants, retirement, Sandra Boynton, seafood, super foods, Sydney, therapeutic, therapy, travel, traveling, Yoda on March 18, 2015 by Rowena. Laugh or Cry: Overcoming Birthday Caketastrophes! Tomorrow, is our son’s 11th Birthday and of course, it’s going to be bigger than Ben Hur. Surprise! Surprise! I decided to bake a Chocolate Cake and I’m jazzing it up with a caramel and whipped cream filling and smothering the lot with lashings of Milk Chocolate Ganache and a sprinkling of M & Ms. I know that sounds really indulgent,even decadent, but you only have a birthday once a year! Chocolate cake…You can’t go wrong with chocolate cake. The meaning of life can be found in Mummy’s bowl. However, you obviously haven’t heard about my luck with making birthday cakes. It’s so bad that I’ve dubbed it: “The Great Birthday Cake Curse”!! For some strange reason, every single birthday cake I’ve ever made has been cursed, doomed, even double-doomed, as all sorts of dreadful complications set in. Yet, with the precision of a surgeon, I painstakingly restore the cake and save the day. Hey, who am I kidding? There’s nothing precise about me in the kitchen. Rather, I’m very “slap dash”, whacking on the icing to camouflage near-fatal, structural craters, which are so deep that you could hide a semi-trailer inside…even an entire road train!! Yet, despite these devastating catastrophes, I overcame the hurdles and had that cake out on the plate, candles alight with everybody singing “Happy Birthday”. My husband’s uncle, who was a builder, always used to say that the difference between an amateur and a professional is being able to cover up their mistakes. Looking at how I’ve patched up my cakes, I can’t help wondering how many houses down in NE Tasmania are being held together by lumps of icing? It’s one of the world’s greatest gap fillers!! Despite my birthday caketastrophes, I’m renowned for my scrumptious pavlovas and choc-chip cookies. Indeed, when I took my choc chip cookies to scouts recently, I was quite the pied piper attracting throngs of little admirers. Indeed, after seeing the cookies in action, I decided to throw out my copy of How To Win Friends & Influence People and simply hand out cookies instead. This only compounds my confusion. What’s the deal with the birthday cakes? Why do I have so much trouble? Who knows? It remains one of life’s great mysteries! No doubt being more practical than yours truly, I can hear you wondering why I don’t just buy a cake instead? Why do I keep torturing myself birthday cake after agonising birthday cake? Talk about a masochist! Well, if you have ever made a birthday cake for someone you love, you’ll know precisely why I have to make these @#$% birthday cakes myself. That’s right. I add that magic ingredient…my love. You can’t buy, manufacture or even fake that and it’s not something you can buy off the supermarket shelf! So here I am the night before Mister’s big 11th birthday expecting a tribe of friends at his party. The cakes have been baked without incident. Everything is proceeding exceptionally well. That was until it came to whipping the cream . A relatively simple task but that’s what turned the tide. Actually, make that whipping the low-fat lactose-free cream. Mister and other family members are lactose intolerant. I was concerned that being low-fat might be a problem but I’m ever the optimist. I’d been beating the absolute crap out of the cream and it was still sploshing around like milk in the bowl when it should have been resembling butter, if not cheese. It had also splattered absolutely all over the bench, anything parked on it and all down my shirt. That was when I dug out my magnifying glass and had a closer look at the label. My eyesight isn’t what it used to be. Oh my goodness! There it was. “Not suitable for whipping”. The cake was doomed. The party was doomed.Disaster!!! It was 11.00PM. The shops were shut and I had two cakes which desperately needed to be sandwiched together. In my desperation, I thought the caramel might just be enough. Being my usual Einstein self, I thought that if I scooped the thicker layer of cream off the “milk” and mixed it with the caramel, to put it good old colloquial Australian lingo: “she’ll be right, mate”. Instead of bulking up the caramel, the cream almost turned it liquid. My only hope was that it would fill up the bubbles in the cake before it ran off the edge and onto the plate. Taking a chance, I hoisted up the second layer of cake and prayed it would stay put, despite slipping and sliding around on roller skates. My only hope now was that the chocolate ganache would hold the cake together against all odds. 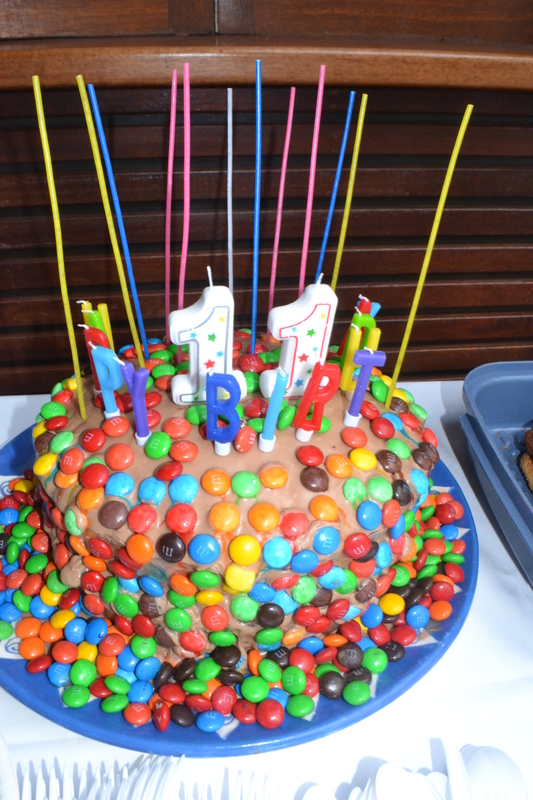 Not to be deterred by my humble prayers, catastrophe followed catastrophe and if I hadn’t developed resilience from all my previous birthday cake disasters, there would have been tears, loud wailing and unceasing sobs as I cried and cried and cried….the world’s biggest loser of a Mum! 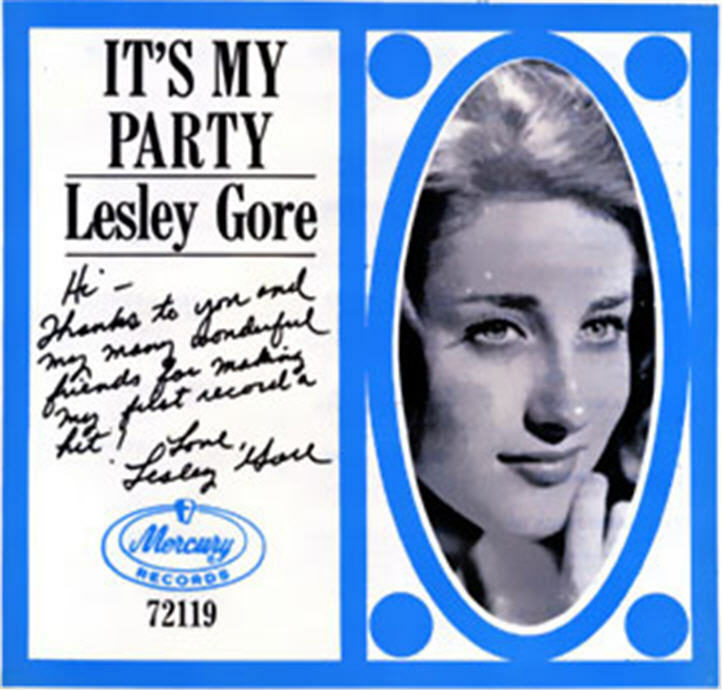 It might not be my party, but I’ll cry if I want to!! You would cry too if this had happened to you! I’m not the only one who gets stressed out by birthday parties! Then and I guess you can see it coming, the @#$% cream stuffed up the ganache, which was sploshing like a chocolate milkshake. Desperate, I added cup after cup of icing sugar, trying to thicken it up. I’d poured in half the bag and it was still looking sloppy but at least, it was holding some shape. I poured the “ganache” over the cake and I looking like a human pretzel, I crossed everything I had to boost my luck. But no! The ganache flowed over the top of the cake and kept going creating a moat around the poor, drowning cake. The river was so deep, you could literally kayak through it. Definitely not the look I was looking for so I started bailing the ganache out with a ladle and not unsurprisingly, it sploshed all over the bench and that’s when I found the dog not unsurprisingly underfoot. This is where the birthday cake curse worked in my favour. Not being my first salvage operation, I had a few tricks up my sleeve. In this instance, the answer had to be M & Ms. They cover up a multitude of sin. Although thanks to that wretched low fat lactose free “cream”, even they mucked up and were sliding down the cake. @#$%!!! However, just when you think you’ve hit rock bottom, there’s salvation. I’ve never been so thrilled. The chocolate ganache monster had a name and it was good. Guess, it goes to show that you can’t go wrong with a chocolate cake after all! Do you have any funny birthday stories to share? I’d love to hear them!! 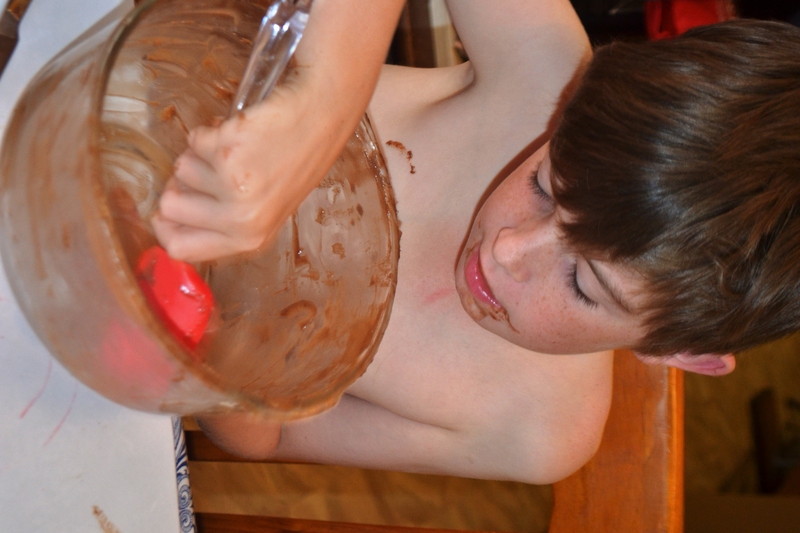 This entry was posted in Australia, Baking, Humour, Love, Parenting, Recipes, Uncategorized and tagged Australia, Australian, baking, birthday, birthday cake, birthday party, birthdays, boy, cake, caramel, catastrophe, chef, child, children, chocolate, chocolate cake, chocolate mouse, cook, depression, food, ganache, Happy Birthday, healing, icing, kids, lactose free, M & Ms, masterchef, mom, Mommy, mother & son, mum, Mummy, party, party food, perfectioism, perfectionist, persistence, recovery, scouts, son, zyomil on March 10, 2015 by Rowena.